It’s the early 1970’s and I’m on the shore of a small lake in California fishing with my Dad, the two of us just having a great time using what we have at the time. Fishing rods and reels have come a long way since then, so have the lures. But I’ll still say this Zebco made my early days a ton of fun! It was a time when fishing success came down to really searching out a location by observing the lake, using our eyes and instincts to locate good fishing spots. And listening to other anglers, listening to Grandpa and taking in his years of fishing experience: real ‘old school’ fishing. To this day, these ‘old school’ ways still direct me on the water. I grew up watching and following the careers of Al and Ron Lindner. Back then it was In-Fisherman all the way for me: I read the magazine and listened to the radio program. I know, I was a fishing geek, but hey, that radio program was amazing. One of the things I remember was the introduction of the Humminbird Depth Flasher. To be honest, I laughed at the idea. My reasoning was if you knew how to fish and where the fish were, why did you need this flasher? So, I ignored the electronics, and just kept to the old ways. But through the magazines and ads I watched the fishing electronics industry grow. Tom Mann and the Allied Sports Company started rigging the first early flashers found on bass boats from radiology health kits. Somehow, they managed to figure out a way to get past the distortion created by the outboard motors of the time and their design took off. With any product there is always a desire to make it better. R&D, feedback from anglers testing the equipment, success at Bass tournaments: all these things made the industry grow in popularity. Soon it seemed everyone needed a Humminbird – the Super Sixty was probably the most popular of the time. Then the first improved LCR units started coming out in the 1980s. At the time, these were the best you could get. Today, they are obsolete bulky has-been units, but they’re part of what got us here. Over time, and as technology improved, fish finders got better and better. At the start of the 1990s there was an electronic revolution going on in the fishing industry. I bought my first Humminbird in 1996 – the Wide 100 – to go with the 12’ aluminum boat I was running at the time. I would set it, and was mostly interested in the depth I was fishing. Back then you didn’t get the detail we get today with modern sonar, but it did help in locating some areas I had previously ignored. However, I grew tired of it. I found it bulky and over time it started getting left at home. My old school style of shoot ‘n’ scoot fishing made a bulky sonar unnecessary. By the early 2000s, LCD display units and GPS were becoming all the rage. My friends were laughing at me because I was so far behind in electronics and didn’t want a sonar. But I usually had the last laugh, catching more and bigger fish without a sonar. I just couldn’t justify paying the money for something I would grow tired of and not use. In 2007 the first iPhone appeared and in 2008 the first Android phones started hitting the market. Again, I was behind the times. My first smartphone was an iPhone 4S which I picked up in 2012. I was impressed, and it was not hard to see the writing on the wall. The power in these new phones was outstanding, and the quality was getting better every year. In 2015, I switched to the Samsung Galaxy – the display was far superior and the thing was fast. My image? I still laugh at that one. I told him, hell, if you’re on the water worried about your image, you’re out there for the wrong reason! My answer kind of stunned the salesman and he left me alone after that. But later he came over and asked why I was so set against the big fish finders. I told him that stuff was already obsolete – the equipment is not worth the big price tag for me because I will not use it. As it is, I don’t use the Lowrance I have in the console other than for depth, that’s it. I knew the smartphone and wireless tech was going to jump fishing sonar into the new era of wireless, so I kept my distance from the expensive, bulky, wired units. Then in 2015, I went out and purchased a wireless Deeper Smart Sonar. I was just blown away with it, the portability and the ability to use it when Ice Fishing was outstanding. These big sonar companies can brag all they want about picture quality, but they don’t come close to the quality of the screen on my Samsung phone and tablets. 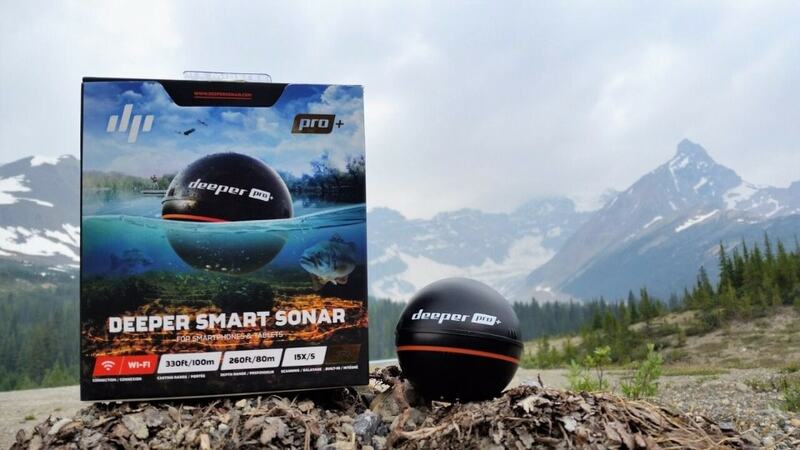 The Deeper smart sonar is the GoPro of the fishing sonar industry. I was so impressed with it, I started talking about it and wrote a blog post for other anglers who want portability and versatility on board. And now it’s 2017 (Yes, 2017! ), and here’s the point. Today we have PCs, laptops, and tablets with word processors – all great ways to get words on paper. So would you still go and buy the most expensive, state-of-the-art, highly recommended typewriter? Put the paper in, roll it into place and start typing. Yeah right! If your fishing sonar is tethered by wires to the back of the boat, it’s obsolete – that’s a typewriter you got there! The era of wireless is here. Just like back in the early 1970s when Tom Mann started things off with the Humminbird flasher, today Deeper is leading the way forward in the evolution of fishing sonar. For many years I was behind the times, but today I’m out on the front line with my Deeper as the wireless revolution gets underway. So my advice to you? Free yourself of the expense, free yourself of the wires, free yourself of the bulky units taking up precious room in your boat, and free yourself of the hassle. Go wireless and go smart.Once you’ve used the Deeper PRO+ and seen how powerful and efficient it is, you’ll be hooked. The ability to create bathymetric maps on the fly without the need for chips, having a sonar you can use anywhere, anytime – it will give you a freedom when you’re fishing that you’ve never had before. So don’t get left behind – the wireless revolution is already here.